Ladies and gentlemen of the jury, I stand before you this day with much grief in my heart. The mere fact that I have to defend the relevance of baseball in this day and age brings me to tears. I grew up reverencing the sport the way middle school girls worship the Jonas Brothers. Now, baseball is a hiss in a byword. How could a game that was once called America’s National Pastime be labeled as a second-rate sport? Why do I believe baseball is still great? Let us explore. Argument #1: It’s pure (kind of) — What? 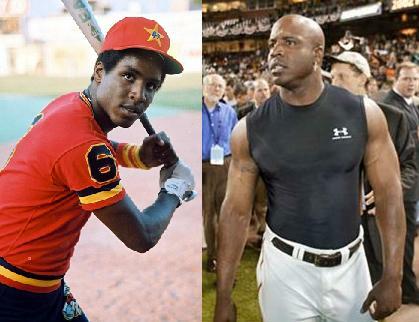 Steroids? I don’t know what you’re talking about. As far as I am concerned Mark McGuire got big on whey protein and Barry Bonds’ head doubled in mass because of some new face muscle exercise he learned on P90X. Even if those beloved long-ballers did shoot the juice, those days are over. Small ball, the art of bunting, stealing and sacrificing, is making a strong comeback, unless you play at the new Yankee Stadium where even Ichiro Suzuki can hit 40+ home runs. That aside, baseball is still considered an art form. Turning a double play, painting the outside corner of the strike zone and laying down a squeeze bunt are things of beauty. Argument #2: It’s a team sport — Most people think that baseball is composed of one-on-one battles between a pitcher and hitter while the players in the field pick daises. I hold firm that baseball is in fact a team sport because of one thing and one thing only: bench-clearing brawls. It’s a thing of beauty to see two teams completely clear their benches and start an all out war in defense of one player. Sometimes even the the coaches get involved. (See Don Zimmer v. Pedro Martinez.) This never happens in basketball, because a) drunken fans will get involved and Ron Artest will go ape on someone, or b) everyone sits back in their chairs because, if they even set foot on the floor during a fight, they get suspended and fined. Only on the baseball field is there this kind of camaraderie. Argument #3: It’s Multicultural — This is the only professional sport in the United States that has succeeded in consistently drawing players from a wide variety of nations. The MLS is not professional, but good thinking. The NFL will once in a blue moon get a player from Canada, but that’s about as international as it gets. The NBA might have a legit case here but, regardless of how successful some of the international players become, they will always be hated. Case in point: Manu Ginobili. (See also Hedo Turkoglu, Tony Parker, Pau Gasol and soon-to-be loathed Ricky Rubio.) Baseball on the other hand has successfully integrated likable players such as Hideo Nomo of Japan (if you were a kid playing baseball in his prime, you know you tried his whirlwind pitching windup) and Jose Contreras of Cuba (that’s right, the power of baseball can even soften Fidel’s heart). Argument#4: Beer Bellies = A-OK — The American people can relate to baseball players because some players resemble the man in IHOP that, no matter what, makes you feel skinny. Just look at Yankees pitcher C.C. Sabathia. Tipping the scales at around 300 lbs didn’t stop him from getting one of fattest deals in game. I can only imagine that does wonders for the game in the minor league levels. While there are many fine physical specimens in the game of baseball, it is a known fact that being in shape is not a necessity to play the game. Anyone (and yes, that means you, Dmitri Young) can play baseball. After hearing my sound arguments, there should be no denying the greatness of baseball in American culture. Sure, it might not keep pace with our instant twitterfication society, but baseball can and will endure the test of time. I rest my case. Jake Welch is a sports writer for Rhombus. He is one of 12 people on the planet who actually care about Major League Baseball.